Here’s a glimpse of the future: Ubiquitous cheap sensors. Perpetual freelance surveillance. Relentless sunlight, directed by shoals of shadowy interest groups. It has been a bounteous season for panoptiswarm-related news (previously: 1, 2, 3). Sea Shepherd has drones now. They are using them to track the Japanese whaling fleet. Occupy has a drone. It is called the occucopter. There is a thing called the Drone Journalism Lab. They just unboxed their first drone. As they document their first experiments with flying the thing and with hacking around the controls and adding better camera gear, they are in good company. 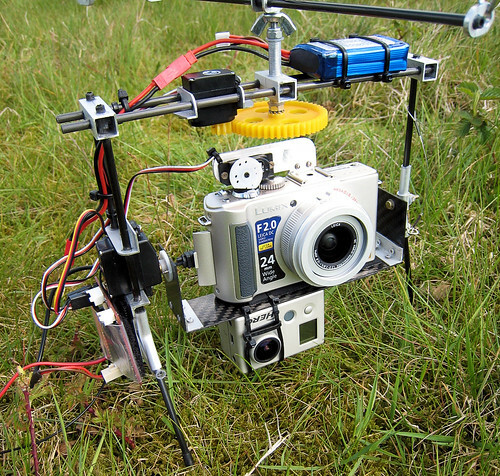 The DIY Drones community will no doubt be of great use. It’s worth sticking with the Lab for a bit. Journalists are increasingly faced with two problems: a growing appetite for unique online video in an environment of decreased budgets; and restricted or obstructed access to stories ranging from disaster coverage to Occupy Wall Street protests. The technology behind autonomous and remotely piloted vehicles is rapidly moving from military applications to the point where private citizens can own and operate their own drone. At the same time, high definition and 3D video cameras are getting smaller, cheaper and lighter. Paired with global position devices, they make ideal additions to an airborne platform. 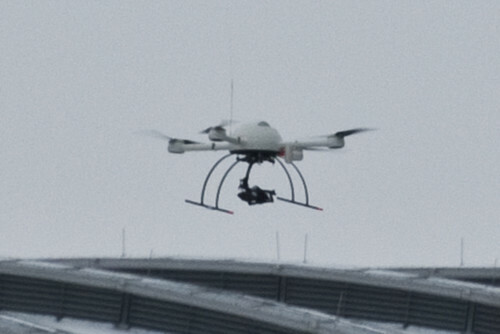 In short, drones are an ideal platform for journalism. It’s an interesting solution to the panoptiswarm problem (when everyone is a journalist, everyone is a disposable sensor node) that nicely mirrors the rise of drones in warfare. Drone war is the perfect antidote to an enemy willing to send suicide bombers at your forces. By splitting the identity that used to link soldier and combatant, you eliminate the tactical advantage of the other side having the terrible resolve to blow themselves up. Their bodies are on the line, but yours are not. Similarly, with drone journalism, journalist’s bodies need no longer be on the line. They may be barred from safe access to the site of the beatings, but they can still put eyes on it. This neatly negates the tactical advantage that police held over journalists in a battle of wills. No longer can the police say “leave the area or you will be tear gassed and beaten like the rest of them,” leaving journalists with the stark choice between ignorance and physical peril. Now they can say “we will leave, but our drones will be watching”. At first glance, this seems to restore the journalist/police/activist triumvirate. A new class of privileged observers, perhaps operating from the Las Vegas desert, can log in and cver the story as neutral observers while police and protestors go about the business of beating and being beaten. Journalism will be literally above the fray. Too late for that. Everyone can afford a drone now. It is cheaper to buy a drone than a smartphone. And if you can’t afford a drone, maybe a camera grenade is more to your taste. Or perhaps you will hack together your own Streetview trike enabling constant passive recording, 360º. Everyone gets a drone now. The paparazzi get a drone. Iran gets a drone. Survivalists, the Westboro Baptist Church, al-Qaeda, your local scout troop, whoever. Put a drone on it. When the time came to rebuild Jenin, “Hamas representatives on the popular committee asked that these walls be built just under average eye level so that passers-by could look into the courts and make sure that Islamic codes of modesty were not relaxed.” No need for that. Just put a drone on the job. We’re still trying to come to grips with the impact of cameraphones. Perhaps future police actions will be announced by an EMP blast, to clear the twittering airspace. Rogue journalists load film cameras as occupiers brace for the assault. The policeman’s mic declares the assembly unlawful. The burst is ineffective. The net interprets a gap in coverage as censorship and rushes to fill it. New drones buzz into position and an enterprising trike journalist, sensing a chance for a payday careens through the police line in the hopes of catching something good.